You have always wanted your car to maintain the same look it has on it when you first purchased it so you can wash it consistently and apply a refreshing coat of wax every few months. However, the exterior of your vehicle has stains, chips, and swirl marks on it despite your commitment to making it maintain an excellent look. You even noticed the presence water spots, grime, and dirt on your vehicle the next day you wash it thoroughly. How will you feel if you come across a product that could help you out of this situation? This product will offer your vehicle a secured shelter from the influence of environmental hazards and make the process of washing your car simple without demanding frequent application. The product is called Ceramic Coating and can also be referred to as the Nano-Ceramic Coating. It is renowned for its ability to make your car more valuable. You need to consider some facts before purchasing the products as these following details are critical. If you are an ardent reader on the internet, there is no doubt that you must have read about some conflicting statements. These statements are made by two factions; the first group comprised of the manufacturers and retailers who eulogized the prowess of their ceramic coatings while the other group consisting of auto-care analysts who provided an unbiased appraisal of the ceramic coatings. It will be good to sort things out on ceramic coatings. 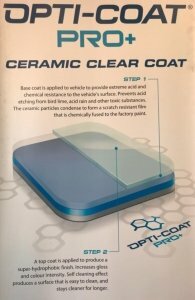 We need to understand the truth behind automotive ceramic coatings and also know their advantages. You should also know their boundaries and the best type for your car. For example, this Tesla Model 3 has acquired a Ceramic coating, window tint and a paint protection film. You can check our YouTube channel for more videos to learn more. A ceramic coating can be defined as a liquid polymer used on the external parts of the car with the use of the hand. Examples are C.Quartz, Ceramic Pro, and Opti-Coat Pro. The coating forms an alliance with the factory paint of the car to produce a coat of defense. Kindly note that a ceramic coating cannot be used instead of a paint protection film, as it offers a more comprehensive defense. It serves as a first-class wax substitute. The essence of a ceramic coating is to generate a perpetual or semi-permanent connection with the paint of the vehicle. With this application, there is no need for repetition of application every few months which will prevent your car from breaking down. The paint of the vehicle will start to show signs of oxidization when exposed to the sunlight and this makes the paint to be dull and faded. Application of a ceramic coating layer will guard the paint of the vehicle against the ultraviolet rays of the sunlight and significantly lessen the impact of oxidation. Chemical stains from natural acidic contaminants can also wreak havoc on your vehicle. The responsibility of a ceramic coating is to create a surface that is strongly resistant to the impact of chemicals and prevent bonding of your vehicle’s paint with some contaminating agents. It will make your vehicle to remain resilient to etching and stains; you must ensure the pollutant is eliminated promptly. An exceptional attribute of a ceramic coating is its hydrophobic nature. It is renowned for repelling water; when your car is laced with a hydrophobic ceramic coating, water will not stay on the surface of the vehicle for an extended period. It will ensure grime and mud will not be able to penetrate and bond to the paint of your car. It will also help you to eliminate contaminants without much hassle when you wash your vehicle. You may consider adding a ceramic coating to your vehicle if you want your paint to be glossy. Application of an excellent ceramic coating will improve the reflective attributes of your vehicle’s paint and clear coat thereby increasing the deepness and lucidity of your paint. As stated above, when you apply a ceramic coating to your vehicle, it adds immense value to it. Exclusive Detail is a renowned market leader specialized in the installation of ceramic coatings for Charlotte, NC and its environs. If you want to know more about our services and book an appointment with us, kindly follow the links below. Make sure you read more information about the defects of the ceramic coatings.